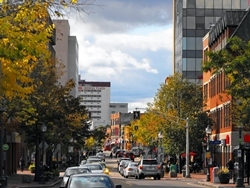 City in Brief: Moncton is located in the southwestern part of New Brunswick in the Petitcodiac River Valley. The city has been nicknamed “Hub City” due to its geographic location at the centre of the maritime provinces, as well as its long history of serving as a land and railway transportation hub. Despite economic struggles in the past, Moncton’s economy is stable and its unemployment rate is consistently lower than the national average.